The 12 musical items in the show cover a number of different styles including rap, swing, pop and chorus line and the show concludes with a terrific showbiz presentation as waiters serve up a veggie feast after the harvest. The show has been written to allow for a large range in cast sizes and features a lot of small speaking parts along with the main roles. For the staging of the show only a single set is needed. One backdrop depicting the garden surroundings and sky along with the veggie patch can be created by mini sets that are wheeled onto the stage. Vegiemania highlights important and contemporary issues about the environment. Kids involved in the production will experience a fun and exciting show while also learning about issues such as reducing your carbon footprint, growing your own food, recycling and being water wise. The council, led by the scheming Mayor Cecilia Gray, have their eye on some much loved vacant community land. They plan to turn it into a car park to encourage more shoppers to visit the centre of town. Knowing that there might be some opposition to their plan they decide to proceed over the summer holidays thinking that everyone will be away and won't bother to make a fuss. The mayor presents to the media and extols the virtues of the parking lot but the local kids and their families are not as apathetic as the mayor assumed and are outraged at the plan. They gather to protest and the mayor, always conscious of her public image and her popularity, agrees to allow them the summer to come up with an alternative plan that will make use of the land. She of course is sure they won't be successful and the parking lot can proceed with no further interference. The kids and the community decide to create a fantastic community veggie garden and given that it's summer, the veggies should be growing well before the council deadline. They battle all sorts of problems including poor soil, attacks by garden pests and birds, and a lack of water but overcome these problems by working together. Meanwhile, the mayor keeps a watchful eye on their activities, hoping to sabotage their efforts so the car park can go ahead. Without warning she enacts water restrictions so the veggie patch can't be watered. Finally, when all seems lost and the garden is suffering from a lack of water, the kids are ready to admit defeat. Luckily a huge shower has the community dancing in the rain, the tank is filled and the veggies get a new lease on life. There is a wonderful carnival like harvest and a veggie feast is served in the town hall as everyone celebrates saving Greenfields Flat, working together and growing your own fresh and healthy food. 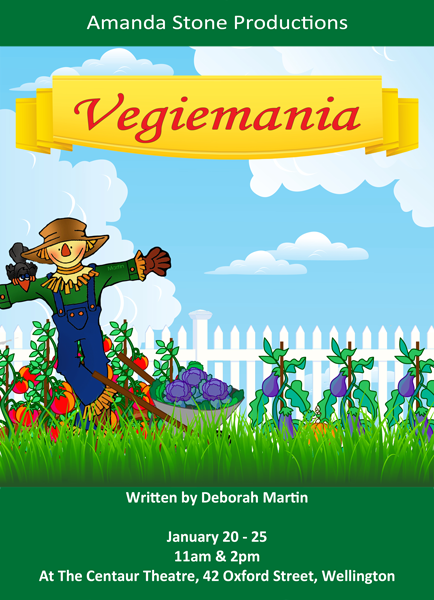 The cast of Vegiemania is comprised of 12 performance groups and a small group of main characters who lead the story. The performance groups and the main actors are able to rehearse their parts separately and then, as the rehearsals more forward, begin rehearsing together. The main characters remain in the wings throughout the duration of the show as they are required to come on and off regularly to link the performance items together to create a cohesive show. Jo and Sam are the two kids who are behind the creation of the veggie patch and are the characters at the centre of the story. Jo is a sensible and mature character who plans and organises the creation of the veggie patch. The character of Sam is more outgoing than Jo and is quick to react to challenges they face in the garden. These are both large roles and they require committed actors who work well together. The self-obsessed mayor, Cecilia Gray, is desperate to get a car park named after herself built in the vacant Greenfields Flat. The mayor is a great role for an actor with a good sense of humour who won't be self-conscious about playing an obnoxious character. Her assistant is Monty who should have the mayor's interests at heart but has sympathy for the kids and their veggie project. This is a lovely smaller role for an actor with good comedic timing. Silas the Scarecrow is a friend to the neighbourhood kids and tries to protect the garden from birds with the help of his scarecrow friends. He is a good hearted and kind character. The rest of the cast is made up of the different performance groups and the 'Veggie Patch Crew' who appear throughout the show to move on mini sets that portray the growing of the veggie patch and the passing of time.